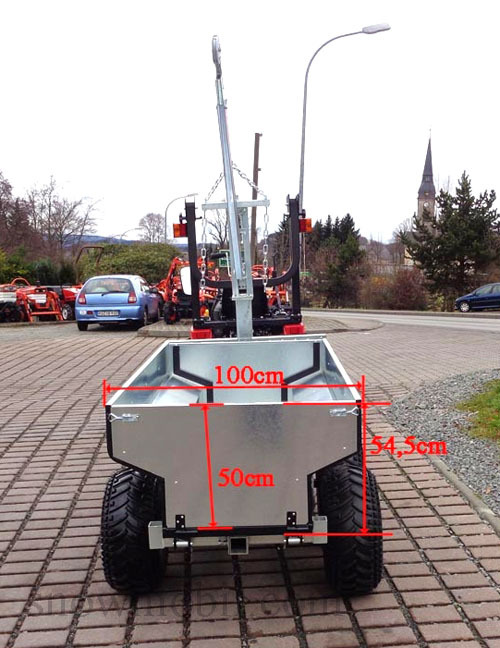 1.090,00 EUR 19 % VAT incl. 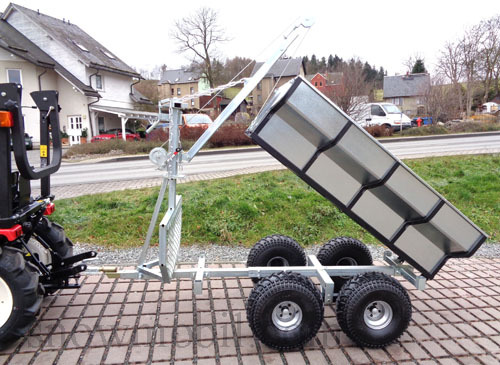 This logging trailer is imported from Sweden. There it is usual to fetch the timber from the forest with Quad / small tractor or jeep. 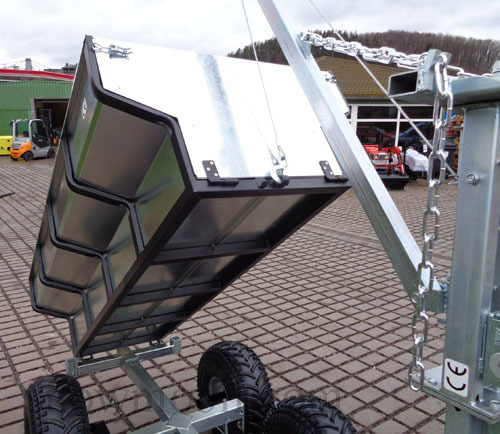 The frame of the trailer is made of galvanized 4-square tubes. 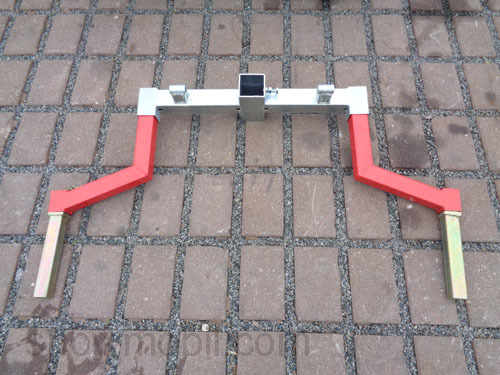 The side supports are made of this material too. 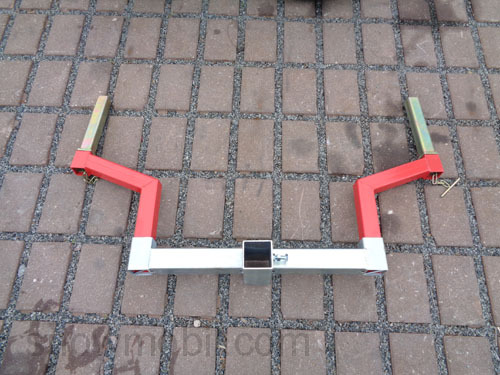 It is possible with little effort to increase the side arms (red 4-Square tubes), by putting a longer 4-Square-tube into the holder. 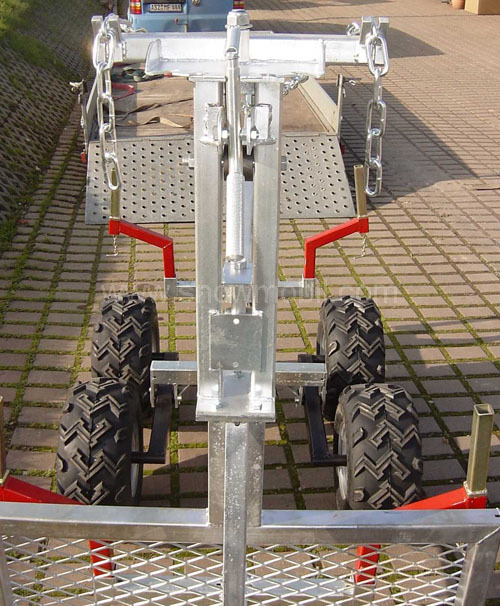 The payload should be no more than 750 kg if it is used on the road because the trailer is unbraked. 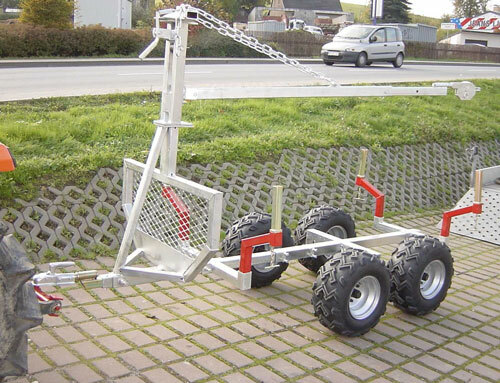 For use in non-road traffic, the payload is up to max. 2 tons. 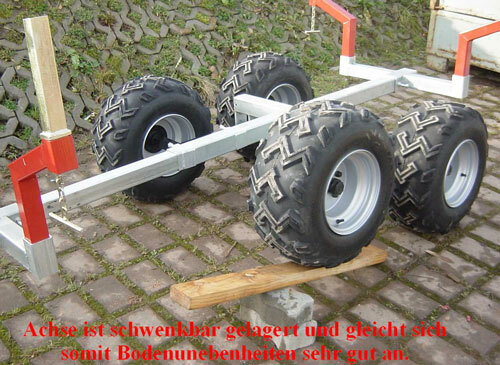 Pay attention to safety on the weight ratio between tractor and trailer or when used on inclines. Only the driver is responsible. 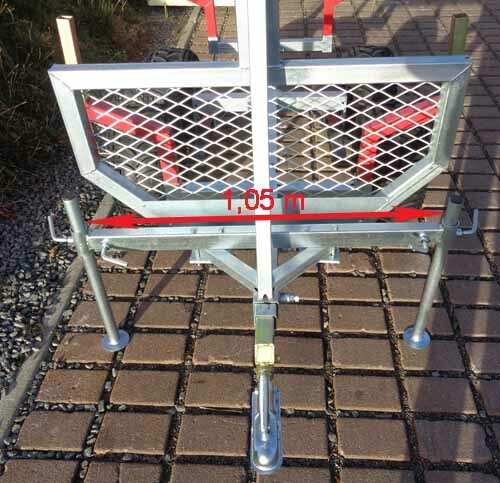 It has a length of 2.40 m and is extendible to 3.60 m. Please check the screws and tighten if necessary. 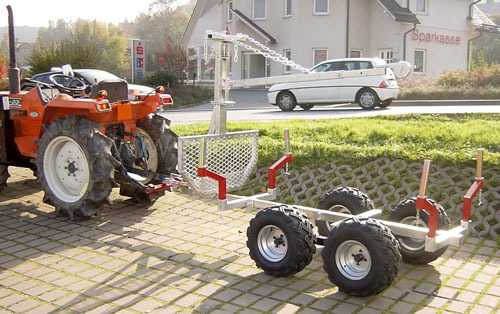 The four large ATV tires are movably mounted on the two axes, so they can adapt to any ground unevenness. 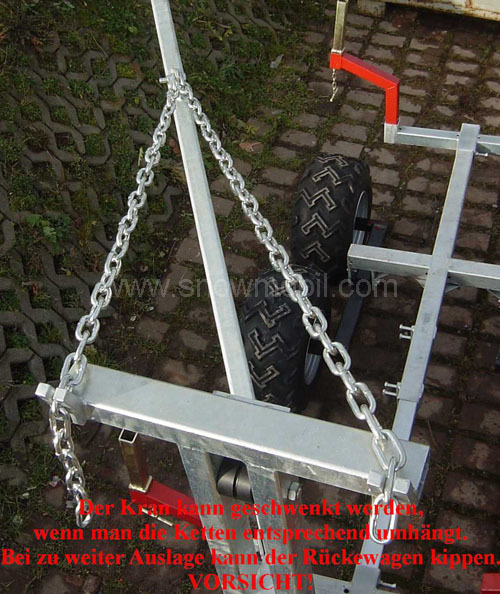 The swing axle is greasable. The trailer has no approval, TUV or similar. 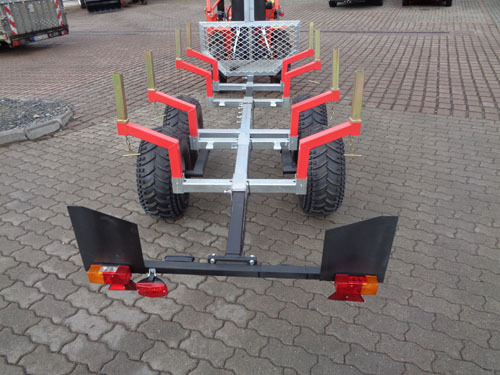 An approval of the DEKRA costs 390,00 Euros - as well as a retrofitting of the trailer on street legal costs 300,00 € (such as light strip, stop light, turn signals/dirction indicator, etc.). 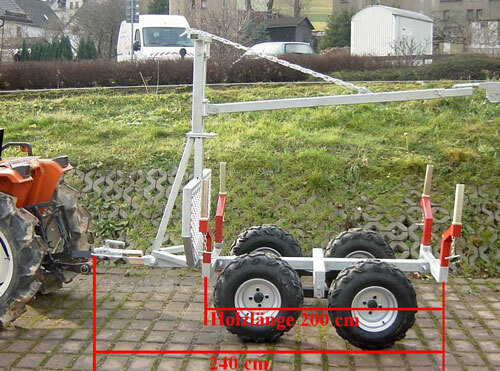 Trailer mounted street legal (freight 350 euros). 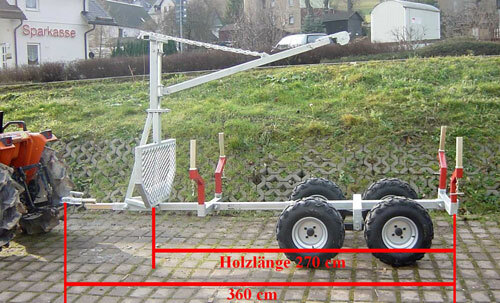 Here you can see the road traffic regulations conversion respectively 2 additional stakes mounted to transport short timber. 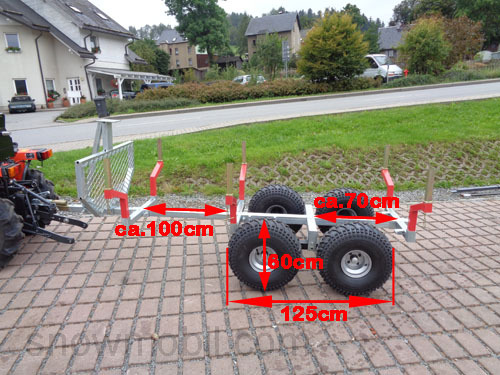 Then the top speed is limited to 25 km / h.
The tire size is 22x12-8 with an outer diameter of 55 cm and a tire width of 25 cm. 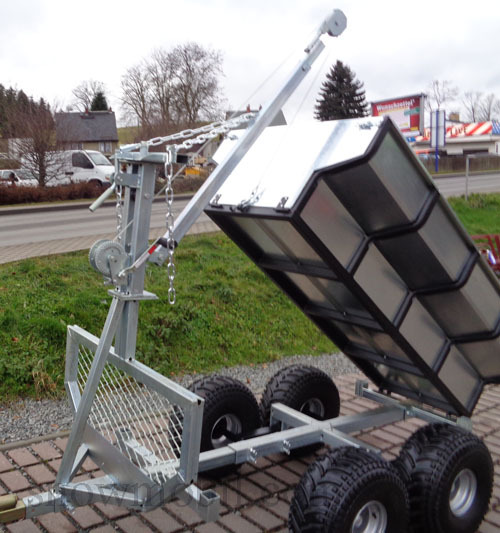 The crane arm can be pivoted and adjusted in height. 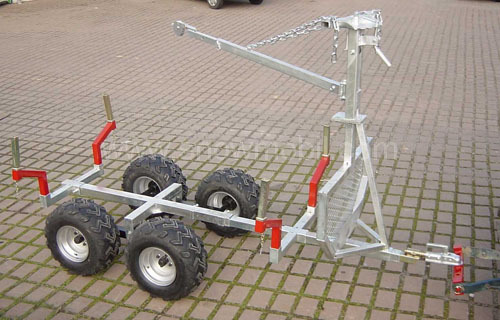 The crane is there to pull the wood on the trailer from behind. 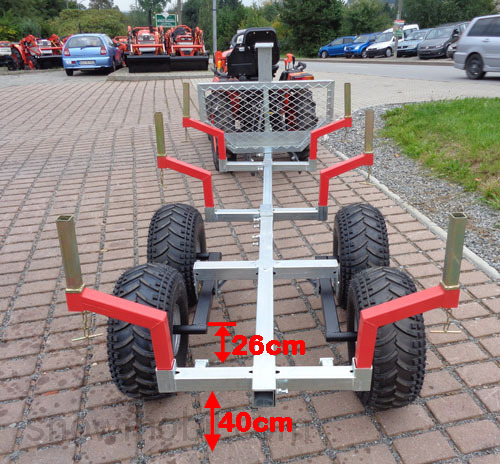 It can be pivoted only in the width of the trailer to arrange the wood on the trailer. 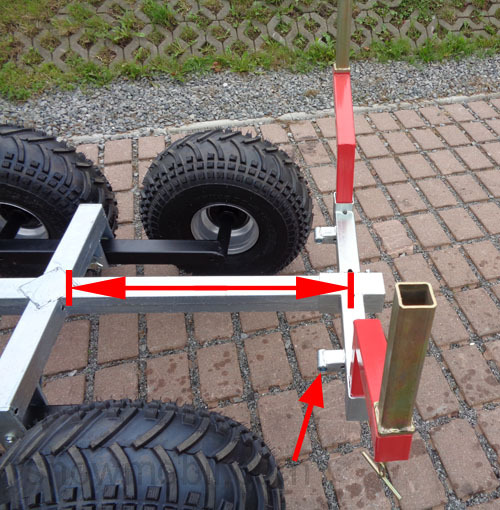 Lateral pivoting across the width of the trailer is not possible because the trailer would otherwise tip over. 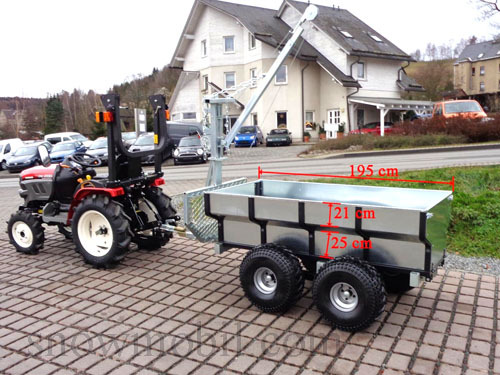 We sell these trailers since 2006 in Germany. 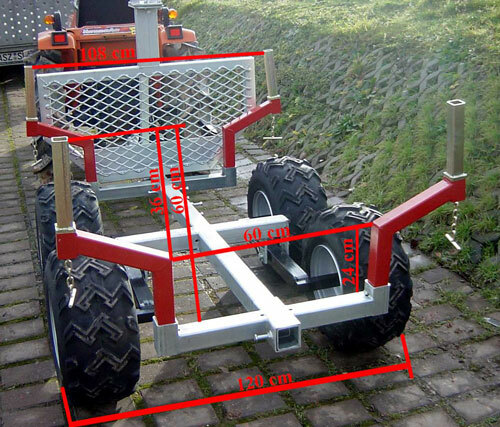 Currently this logging trailer is supplied with this tire profile. Here the skip / cargo box is mounted. 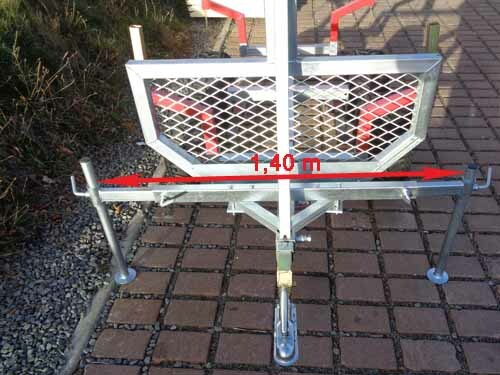 Additional stanchions are available for 89.00 Euro surcharge. 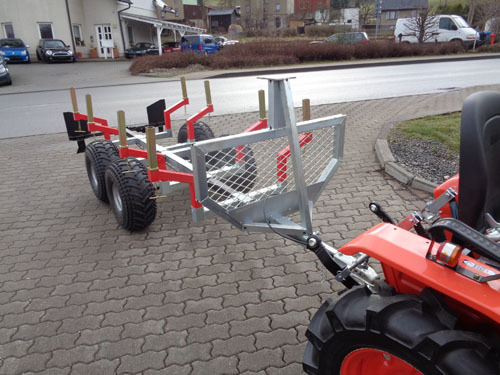 With this trailer you have a useful helper for timber transport. 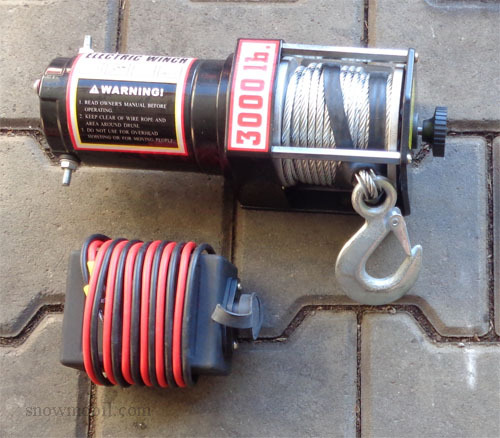 Winch 12V for 225.00 Euro extra cost. 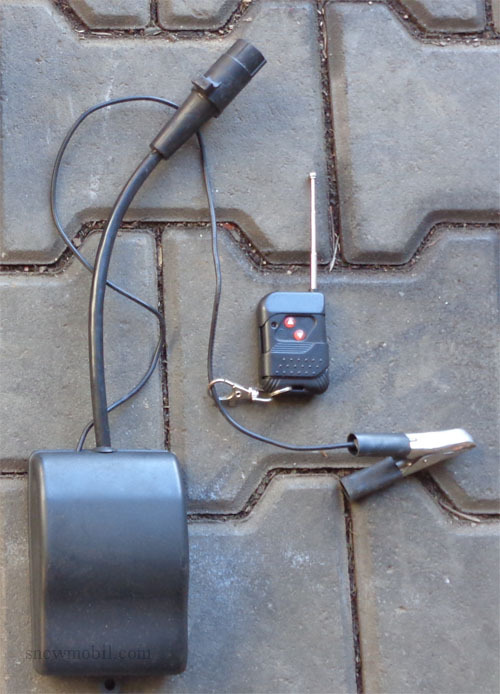 Remote control for 80.00 Euro extra cost. 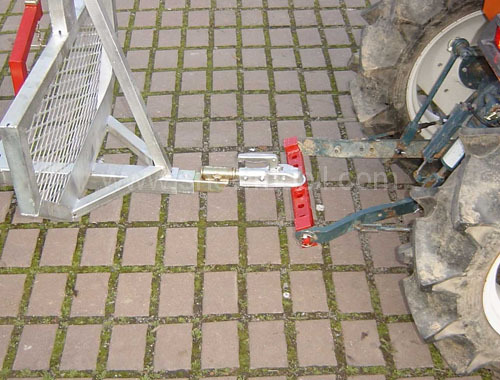 Hand Winch for 60,00 Euro extra cost. 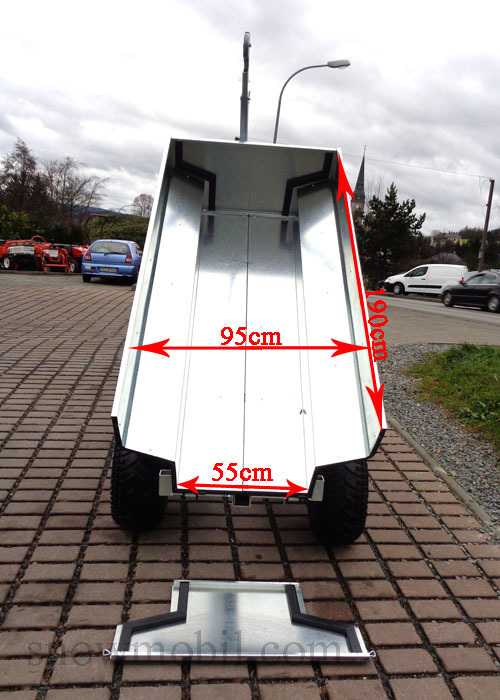 Skip/Cargobox for 350,00 Euro extra cost.